Now that I am back working in my own studio, I am embarking on a new series of paintings. This new series sprung from the inspiration of going through Danni's extensive art library while "studio sitting", sometimes I would go back again and again to a particular book. 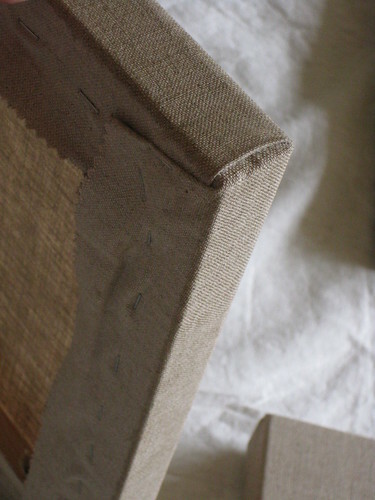 I have also decided to experiment with unprimed linen, where I size and apply the painting ground. 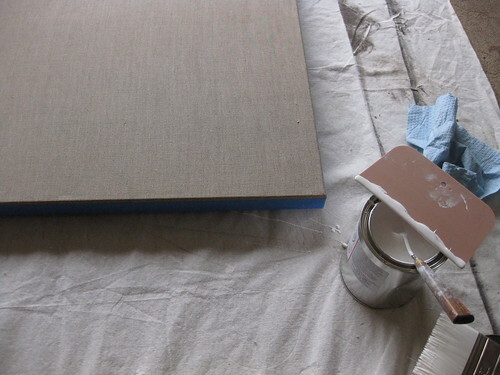 Typically I purchase pre-primed linen and stretch my own canvases as it saves some money doing it this way. As this is a labor and time intensive process and there is a learning curve, I thought you may be interested in the steps required. Following are some photos of the various details and steps. 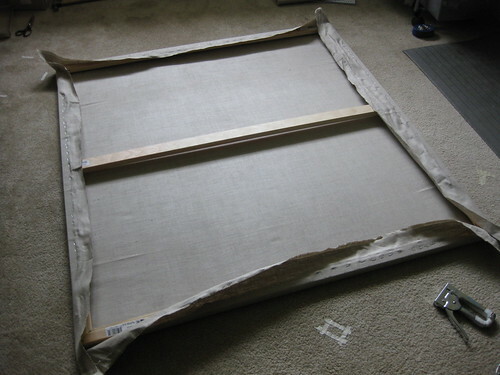 This is the largest canvas I am going to paint, 48x50 inches. 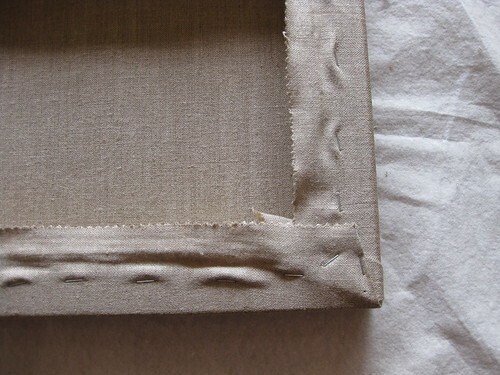 The unprimed linen is attached as evenly as possible to the frame, watching to make sure the grain of the fabric remains the same along the edges so as to not have uneven tension. The stretcher bars are 1-1/2 deep, I am thinking about reinforcing the corners some with metal brackets from a hardware store as there is a bit of flex that concerns me. 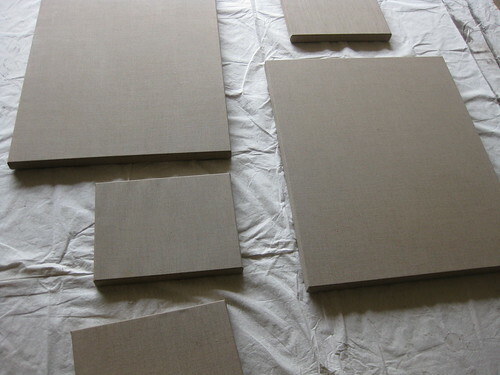 Here are some of the other canvases, each has two layers of Gamblin PVA size. I applied the size to the front and sides of the canvas. Another corner detail. 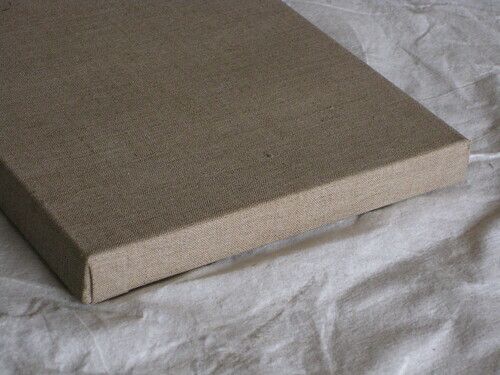 As a rule I have decided that the short side will receive the flat fold, so each canvas is constructed the same. Getting ready to apply the Gamblin oil painting ground. I applied blue painters tape around the edge to give a nice clean smooth edge of where the ground stops. This is a pretty messy step, so be prepared with lots of rags and to ruin what you are wearing. I managed to get this stuff on everything I came in contact with... I will let the first layer dry to the touch, lightly sand it and then apply a second layer of the ground. Here is a link to the Gamblin website with further information.